Maine lies within United States Department of Agriculture (USDA) Hardiness Zones 3 to 5. While northern parts of Maine experience cool, dry summers and cold, dry winters, the coastal regions enjoy more moderate temperatures throughout the year. 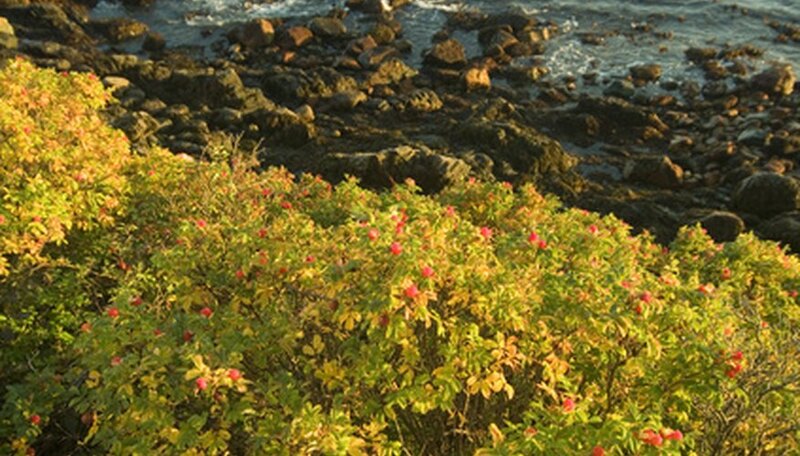 If you live in Maine, select flowering plants according to flower color, bloom time, general culture and intended use. Various flowers grow well in Maine gardens during the summer. The cut-leaf anemone (Anemone multifida), also called the red windflower and the early thimbleweed, belongs to the buttercup family (Ranunculaceae) and usually forms loose clumps ranging from 6 to 20 inches tall. This anemone species features sleek, hairy stems and green leaves that contain slightly toxic principles. Flowers bloom from May through August, featuring white to pale yellow inner petals and green, purple or yellow outer petals. This perennial flower tolerates various lighting conditions, but prefers moist, gravelly soils. Maine gardeners often use the cut-leaf anemone in woodland gardens. Three-leaf goldthread plants (Coptis trifolia) belong in the Ranunculaceae plant family and bear slender, leafless stalks that reach up to 6 inches in height. Flowers appear from April through July, featuring single white to pale purple flowers with white stamens. The bright yellow, underground stems were once used to treat mouth ailments. This perennial likes moist, cold soils in shady locations. Maine gardeners generally use three-leaf goldthread plants in mossy woodland areas and swamp margins. Roundleaf sundews (Drosera rotundifolia) are carnivorous plants that belong to the Droseraceae plant family. This sundew species features thin stalks and white to light pink flowers that bloom from June through September. A moist, sticky substance causes insects to stick to the plant as the leaves close inward to trap the prey. This perennial needs wet soils in fully sunny positions. The roundleaf sundew performs well in Maine bog gardens and swamp margins. The purple joepyeweed (Eupatorium purpureum), also known as the sweet-scented joepyeweed, belongs in the daisy family (Asteraceae) and tolerates various lighting conditions. This perennial features thin, pointed leaves and stiff stems that reach up to 6 feet in height. Large, rounded flower heads feature many small, light pink to lavender blossoms. These flowers bloom from July through September. Maine gardeners often use the purple joepyeweed in moist woodland gardens and prairies. The Robert geranium (Geranium robertianum), sometimes called the herb Robert, belongs to the Geraniaceae plant family. This summer-blooming annual bears green leaves that release a foul odor when bruised or crushed. The Robert geranium blooms from May through October, featuring paired, pale purple or pink flowers on top of red, hairy stems. This flowering plant performs well in Maine woodland gardens. The cup plant (Silphium perfoliatum) belongs to the aster family (Asteraceae) and ranges from 3 to 6 feet in height. This perennial earned its name because the leaves come together at the stalk to create a little cup. Water collects in the cup and attracts pollinators. Flowers add color to Maine gardens from July through September. The flower heads consist of 20 to 30 yellow blossoms with deep yellow center disks. Cup plants prefer wet soils that receive plenty of sun. These flowers work well in hummingbird gardens, moist woodland areas, butterfly gardens and prairies.